Catherine Bell Smith is an artist whose mid-west roots are a point of pride and a source of inspiration. Her work is composed of and influenced by natural elements collected and pocketed from the places she encounters while exploring country roads, walking city streets, and cultivating her half-acre garden. Primarily an installation artist, Bell Smith also applies her concepts to two-dimensional constructs and small-scale sculptures. Her work draws fine lines of connection between nature’s example of life in balance and humankind’s journey toward purpose, understanding, and integrity. The use of degradable materials directs the conversation toward what is under-valued, over-looked, or marginalized in the world today. Bell Smith is co-director of the “Sign Your Art” street art project that can be viewed here and co-creator of a new community organization, Columbus Open Studio and Stage. Her local business, Arlington Frames, is a 24-year success. 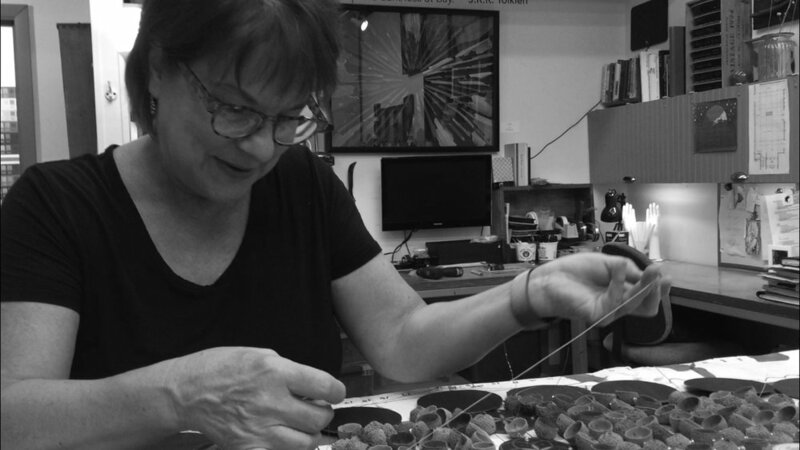 Bell Smith holds a Master of Fine Arts degree in Sculpture from Ohio State University and a Bachelor of Fine Arts degree from Bowling Green State University.